Nothing tops this White Chocolate Cheesecake Recipe! 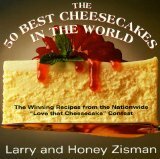 I found this white chocolate cheesecake recipe on www.chefs.com where it got rave reviews. Then I noticed that it didn't contain any eggs, so I was really curious. I'm going to make it this week for my brother's 30th birthday. I'll let you know how it turns out. If you beat me to it....let me know how you fared by clicking here. 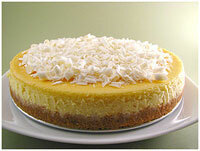 Thanks to Christine for sharing this photo of her White Chocolate Cheesecake Recipe. You can see her recipe by clicking here. Preheat oven to 350°F. In a large bowl, mix together the cookie crumbs, 1/3 cup sugar and melted butter. Press into the bottom and along the sides of a 9-inch springform pan. Set aside. In a large bowl, place the cream cheese and beat well until fluffy. Add vanilla and almond extracts. Add the remaining 1 cup of sugar and beat for 5 minutes. Add melted white chocolate and beat for 5 minutes. Add sour cream and beat for 3 minutes. Pour into your prepared crust. Tap the pan on the counter to release any air bubbles. Bake for 30-35 minutes, or until the filling is set. Turn the oven off, but keep the cake in the oven for another 15 minutes. Transfer to wire rack to cool. When cooled refrigerate for at least 6 hours, but preferably overnight.